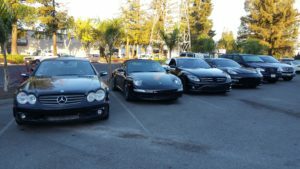 Best German Car Repair near San Jose | Call Master Automotive Now! At Master Automotive, you will experience the best independent German auto repair & service in the San Jose area. Quality, integrity, and value have been the engine behind our business for the over 20 years. Our excellent reputation and superior expert knowledge of BMW, Audi, Mini, Mercedes, and Porsche vehicles has allowed our family-owned business to thrive in Santa Clara since 1995. We are dealer trained, ASE master certified, and we have factory level tools to repair and maintain your vehicle. Our friendly and knowledgeable staff will work with you to make sure you understand what best services your vehicle needs. We guarantee customer satisfaction and our goal is to provide the very best service – every time. In addition to our convenient location near the San Jose airport, we also offer evening and weekend hours to accommodate your busy schedule.